In the nineteenth century when Friedrich Nietzsche descried “God is dead” he was voicing his opposition to several competing worldviews; the liberal secularism of his time, Immanuel Kant and post Kantian German Idealism, and to Christian ideology. It is to the latter group that the famous phrase echoes most profoundly and whose resonance is most far reaching. In his response to Christian ideology, Nietzsche is denouncing the scripturally literal and dualistic concept of God as an agent outside of the world who doles out rewards and punishments of heaven and hell in simplistic and un-allegorical terms. As German thought tried to decipher a more sophisticated and numinous God, Nietzsche alerted his contemporaries with the cry of “God is dead” in order to say that we can no longer go back to the simplistic concept of a dualistic God seen as apart from the world. Over a hundred and fifty years later there appears to be a new twist on this old phrase. Prominently displayed on the billboards of London buses are the sayings of the evolutionary biologist Richard Dawkins stating that, “God probably does not exist, so relax and enjoy life.” This modern version of the phrase has a nuance which is suggestive of hedonism. This, however, is not an all-out cry for atheism. Dawkins’ message is softer than, for example, Jacques Monod, the celebrated biologist who claims atheism as the proper response to the pointlessness of existence; that we are mere chemical accidents. What Dawkins is responding to is the fundamentalist version of God, which Nietzsche has already done away with. Dawkins is not attacking the intuitive and mystical notions of God but rather the old fashion “God in the sky” of fundamentalism. To address the shortcomings of the fundamentalist worldview Dawkins should rather have said, “Don’t come to God out of fear,” and that coupled with the question, “Is God good?” The question of God’s goodness has deep philosophical roots, and this leads one down a beautiful and inquisitive path which suggests God as something more wondrous than His reduction to a dualistic agent. But by saying relax and enjoy life, Dawkins is feeding one of the burning motivations for fundamentalism; the fear of hedonism. The fear of hedonism in its worst aspect; pleasure seeking run amok, satiation without restraint, and everywhere chaos. Not only does this fear of hedonism fuel fundamentalism, which is the theological response, but it fuels fundamentalist terrorism, a political reaction to the very same fear. There is another way of viewing God which is gaining acceptance in the West. A view which raises God from the triviality of the fundamentalist worldview and the mockery of Dawkins. A view which brings into perspective a more sophisticated, more accurate and more mystical God rising from the ashes of the funeral pyre Nietzsche had prepared. This view finds its articulation in Quantum Physics. Drawing on concepts brought to light by Einstein and advanced by a host of thinkers and scientists including Rupert Sheldrake, Roger Penrose, Feynman, David Bohme, C. Blood and others, I have become one of the leading voices of this new paradigm in science. In my book God Is Not Dead as well as in the movie The Quantum Activist, in which I state my case rather succinctly, there is a new blending of philosophy with religion, of science with intuition. God as consciousness. The God suggested by Quantum Physics is not the literal God of the scriptures, but the sophisticated and numinous God who is described within the scriptures; described through allegory and symbols, as well as anecdotally. There is a long tradition in the West of a God of Consciousness who resists literal descriptions dating back to Plato. Origen, one of the early church fathers, along with Augustine appropriated Plato’s Idealism for Church doctrine. Later came Erigena and St. Gregory of Nyssa who integrated Neo-Platonist thought with Church dogma. And Thomas Aquinas who brought Aristotelian concepts within Church cannon, arguing that Reason was capable of operating within faith. Judaism and Islam as well have always valued rigorous Talmudic and Koranic debate about the interpretations of meaning within scripture. So, we see that Western theology has a long history of looking for the sophisticated God of meaning and intuition to back up, as it were, the more literal God of devotion. In other words, a path of wisdom. But in the West this tradition has been marginalized. It has never been taken up by the mainstream. It has never seeped into the consciousness of humankind, but rather has remained a debate or discussion among select theologians, philosophers and the odd enlightened scientist. In fact, ever since the codification of Church doctrine in the Medieval Ages, philosophy and religion have largely gone separate ways. To the mainstream mind, religion has become almost completely devotional, while philosophy, barely existent to the mainstream, has attempted to pick up the slack in its dealing with Reason and Meaning. Bridging this gap between philosophy and religion, and speaking of God and the nature of reality in terms of consciousness, and backing itself up with mathematics to the point where Schrodinger’s equation in a sense proves the existence of God, Quantum Physics ushers in a new paradigm, a new dialogue, a new way of viewing an old concept. In Quantum Physics, God is transcendent, is of everything, is non-local. God is an agent of causation who acts outside of the material universe but effects things within the material world. God is consciousness as non-local, and we are resonant with God when we are not in our ego consciousness but in a non-local state. It is what mystics refer to as God Consciousness, or the oceanic feeling. Quantum Physics offers a tight philosophical model based on the fact that consciousness is primary to everything. Things, thoughts, feelings, emotions are all waves of possibilities; waves which are collapsed into actuality by consciousness. Therefore consciousness, not matter, is the ground of all being. (This is an idea not uncommon in religious and philosophical circles, but which is revolutionary in science.) The new paradigm of Quantum Physics speaks in a language which is scientific, clear and objective. Yet unlike science and most philosophies, Quantum Physics espouses orthopraxy as well as orthodoxy. That is, right practice as well as right doctrine. It offers us the concept of Quantum Activism. The goal of this activism is to explore quantum possibilities, to multiply quantum choices, to experience sudden discontinuous leaps of creativity, to process meaning, and to make the fruits of these efforts tangible and transformative in society in much the same way religions would preach the practice of virtues. In the East, traditions have not so divided philosophy from religion as has the West. Intuition has always been central to Eastern traditions. By embracing philosophical and mystical trends in their texts, stories and doctrines, mainstream religions of the East are more comfortable moving between intuition, reason and faith. Quantum Physics presents this integrated dynamic to the Western mind. Reason is possible within intuition. It is a wisdom path for westerners with experimental data to stimulate, satisfy and correlate the mind of reason with intuition. Quantum Physics puts God back into philosophy and Reason into religion. And what is perhaps most revolutionary is that Quantum Physics appeals to a large audience: To the educated layperson, the spiritual seeker, and the philosophically inquisitive alike. It has yet to win over the scientific world, but that is coming. This new paradigm is not just for the elite curiosities of selected theologians or philosophers, it is a message for the mainstream. What is Amit Thinking About? As every student of science should know, Darwinism is an incomplete theory of evolution. Materialists tout it, of course, as infallible as protectively as religions hold on to their dogma. One of our most important archetypal values is truth. All our intuitions hint at a truth-value, and that bothers us: Seek and ye shall find, and you will be troubled! If we follow up our troubled minds and engage creativity, the products will express a transcendent truth—this truth is a common aspect of the archetypal themes. “My country is truth,” intuited the poet Emily Dickinson. Politicians, beware! The Dalai Lama once said something to this effect, “No model of reality is complete without quantum physics.” It is most important to comprehend this message. So, this is where I will begin. What is Amit Talking About? 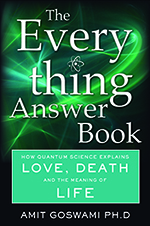 Take a listen as Dr. Amit Goswami returns to The Zone Show to discuss his latest work, The Everything Answer Book: How Quantum Science Explains Love, Death and the Meaning of Life with host Tom Evans (August 3, 2017). Take a listen as Dr. Amit Goswami discusses his latest work, The Everything Answer Book, with host Loretta Brown on The Loretta Brown Show (March 16, 2017). Dr. Amit Goswami joins host Sher Safran on A Deeper Journey into the World of the Economics of Consciousness (August 18, 2016). Dr. Amit Goswami makes a return appearance on The Zone Show with host Tom Evans to discuss his progress in introducing and adopting a mainstream quantum worldview (August 1, 2016). Listen in as Dr. Amit Goswami discusses "Quantum Economics: Transforming the Energy of Money" with host Dr. Rita Louise on Just Energy Radio (June 4, 2015). Enjoy a fascinating discussion between Dr. Amit Goswami and hosts Brenda Michaels and Rob Spears as they explore how we can and are changing during this Shift of Consciousness on Conscious Talk Radio (May 28, 2015). 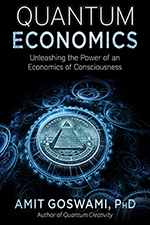 Dr. Amit Goswami discusses Quantum Economics: Unleashing the Power of an Economics of Consciousness with author Bill Kenower on Author2Author (May 26, 2015). Goswami’s basic premise is that quantum physics is not only the future of science, but it is also the key to understanding consciousness, death, God, psychology, and the meaning of life. Quantum physics is an antidote to the moral sterility and mechanistic approach of scientific materialism. Moreover, it is the best and clearest approach to understanding our universe. In short, quantum physics is indeed the theory of everything. The Spiritualization of Economics, Business, Politics, Education, and Society Itself. This fascinating new book will appeal to a wide array of readers, ranging from those interested in the new physics to those captivated by the spiritual implications of the latest scientific breakthroughs. Since the meltdown of the economy, Amit Goswami, PhD, physicist and author, has been focusing on important issues for a New Paradigm for economics and business for the twenty-first century, touching upon the important issues of stability and sustainability of the economy and leadership, creativity and ethics in business, and finally offering a way to achieve a revitalized business arena, an economy of sustainability, prevention of economic meltdowns, and, once and for all, eliminating poverty and hunger. A must-read for the businessperson and the consumer! In Quantum Creativity, Amit Goswami, Ph.D., physicist and author of The Self-Aware Universe, explores human creativity through the unique lens of quantum physics offering readers a new way to nurture and enhance their own creativity—the ultimate source of joy and fulfillment. Click here to order today! Don't miss the award winning documentary film illustrating Dr. Goswami's work. Purchase your copy for $12.99 (plus shipping and handling) by writing to info@amitgoswami.org today! Quantum Physicist Amit Goswami has co-founded Quantum Economics Business Coaching™ in collaboration with Dr. Jim Alvino -- international speaker, trainer, author and business coach. Quantum Economics Business Coaching (QEBC) intends to engage entrepreneurs, business owners, corporations and organizations across all industries and markets to help them implement the principles of Quantum Economics in the workplace. To learn how you can become involved with QEBC, or to schedule a lecture or workshop, write to Dr. Jim Alvino at: jim@QEBusinessCoaching.com, or call: 714-717-9301 or 855-626-4562. Non-Locality: We are all interconnected - even without signals, and experimental evidence is proving our inherent unity. Tangled Hierarchy: In our brain, we become one with the neuronal images of an external object because of a tangled-hierarchy, a circularity. The observer is the observed. Discontinuity: The discovery of something new of value in thought is a quantum leap of Aha! insight. Copyright © 2019 Amit Goswami, Ph. D. All Rights Reserved.